Are You Geezer-Fit? - Just Move! Are You Geezer-Fit? 10 Exercises to Get You There! Are you tired of seeing older people depicted as slow and weak? Are you among those who are defying the stereotypes by staying active? And do you have a streak of healthy competitiveness, even (or especially) if you’re only competing with yourself? If so, I have a challenge for you. 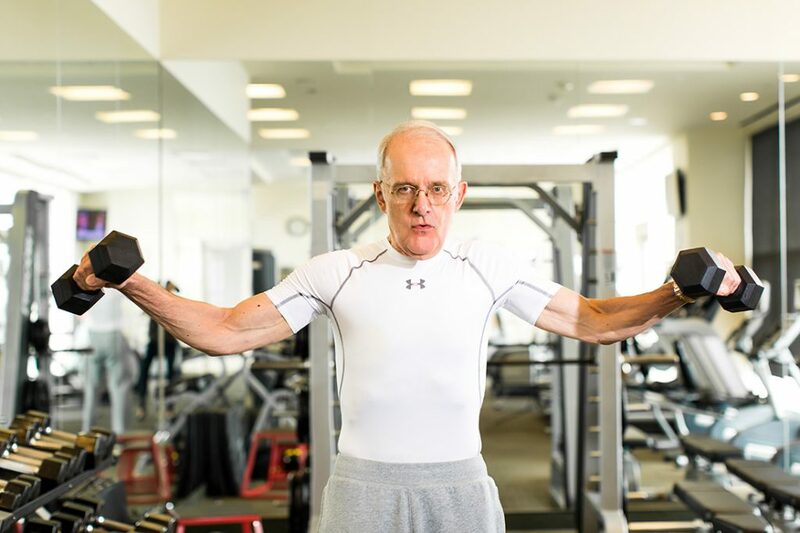 At the age of 77, I’m not afraid to be called “old.” In fact, I embrace the term “geezer” because I’ve worked hard to become “Geezer-Fit” and proudly wear a muscle shirt I had made with that legend. Recently I decided to attach some specifics to that phrase. What does it mean to be “Geezer-Fit”? With the help of a kinesiologist and a certified fitness trainer experienced in working with older clients, I’ve come up with a list of 10 basic exercises as a fitness benchmark for myself and my fellow geezers/geezerettes. The exercises illustrated are ones highlighted in my book, Just Move! The others on the list are common strength training exercises you may know or can easily find on the Internet. All but one use your own bodyweight for resistance. If you can meet the goal for all ten of these, you’re crushing it! If not, that’s okay! It just tells you where you might want to put more focus if you want a balanced and functional body. These exercises also provide one more chance to show what we older folks can do! I’d love your feedback and suggestions. You can use the contact form on this website (simply scroll to the bottom), or email me at jimowenjustmove@gmail.com, or leave a comment on my Facebook page, @justmovebook. 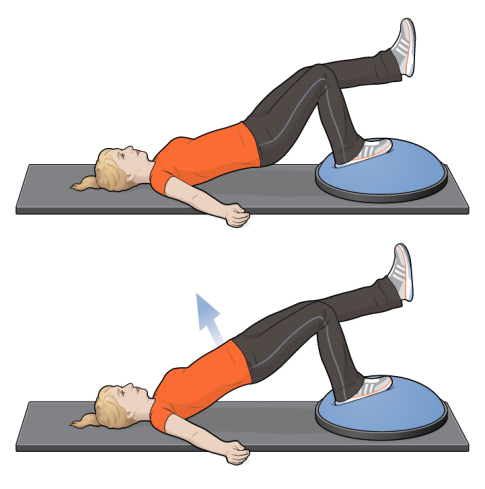 IMPORTANT NOTE: Please do not attempt these exercises if you have not been cleared for vigorous activity by your doctor, and immediately halt any movement that causes pain. Keep your spine and neck in a straight line to generate muscular tension throughout your core. 10 repetitions, getting as close as you can, without strain, to a 90-degree bend at the knees. 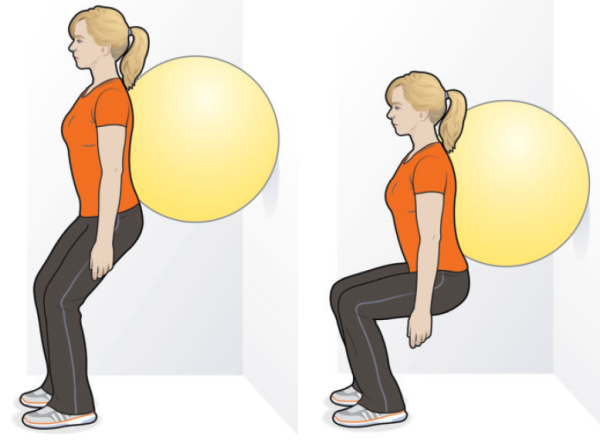 Use of the Swiss ball adds stability and makes the exercise much safer than the classic version using an Olympic barbell. Placing feet a bit wider than the hips and pointed slightly outward will make it easier to achieve the full range of motion (90-degree bend at the knees; keep the chest lifted. Stand erect on one leg, holding up the other knee so your thigh is parallel to the floor. Start in a standing position, move into a squat position with hands on the ground, kick feet back into a plank position while keeping arms extended, return to a squat position, stand up, ideally in an explosive, jumping movement. Your entire body should be held in a straight line with no sagging midsection. With a jumping motion, alternate between two positions: (1) feet together and arms straight out to the side, palms forward; (2) feet to the side a little wider than shoulder width, palms together at shoulder height. 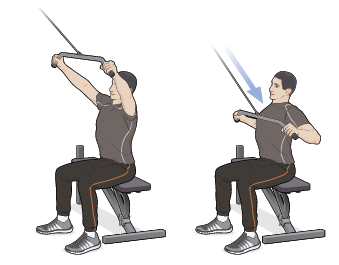 Keep chest lifted and elbows pointed down; grip the bar at a point a little wider than shoulder width; pull from the back muscles just below the shoulders. Forward lunge: Step forward, keeping your front knee in line with your ankle; lower your back knee as close to the floor as you can without touching it. Side lunge: Step to the side, positioning the foot of the lunging leg so that the knee moves beyond it. 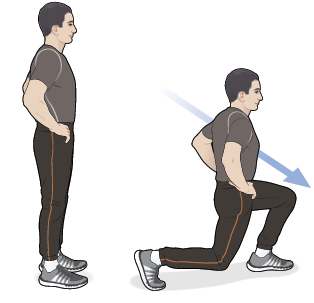 Reverse lunge: Same as forward lunge, but starting with a step backward. Transverse lunge: Rotating at the waist, position the foot of the lunging leg behind you and pointing to the side. Stand on one leg, with knee slightly bent, and bend at the hip, extending the other leg behind you for balance. Slowly reach forward until you touch the floor; slowly reverse to a standing position.